Here is the current state of affairs in my life: DC, where we live, is currently under a heat advisory and warning of hyperthermia. Two thoughts on that: one, I don’t ever recall that happening in the 18 years I lived in Florida, and two, I am guessing Firefox is underlining “hyperthemia” as a misspelled word because it is so rare! Additionally my kitchen is an appliance graveyard. I have a broken refrigerator, in the wall, a new one in the dining room, a hole in the wall that is too small for the ovens, and two dishwashers. Needless to say, I am not doing too much cooking, and yes, I am very hungry for the weekend! This week’s Hungry for the Weekend features summer fare: ice cream, BBQ, grilling, and a rebuttal to America’s favorite treat, the s’more. Gluten Free Chocolate Chip Cookie Dough Ice Cream – This sounds like an amazing idea, and yes, it is my favorite flavor! What Happens When You Order Every Mix-In at Cold Stone Creamery – Is this ridiculous? Yes. But, I bet it was a lot of fun, as ice cream should be. I Can’t Take it any S’more! – One writer’s undying disdain for America’s (and my) favorite camp side treat. 13 New Things to Grill – Pork and lamb seems obvious, but the brussel sprouts sound delicious. 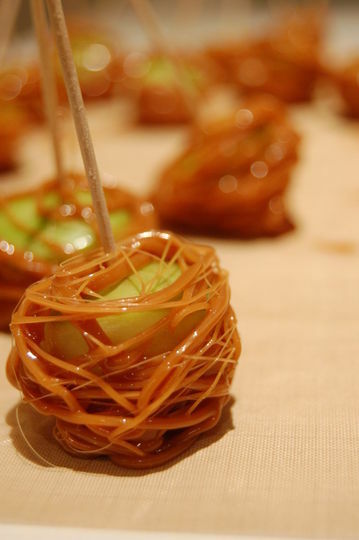 5 Awesome Ways to Eat and Apple – Seasonally this is premature, but there are some great ideas for fall. This entry was posted in Her Kitchen, Seasonal, summer and tagged cold stone, cold stone mix-ins, gluten free, gluten free ice cream, grilled vegetables, grilling ideas, jesse schenker, recette, recette nyc, summer grilling. Bookmark the permalink.